My father was a gardener. He grew vegetables primarily. Long before it was fashionable — but rather during the heyday of chemically-rich, perfectly green, and pesticide-laden lawns in the suburbs — my father carved out one-sixth of a relatively small backyard for vegetables. He also appraised the sides of the house, as well as sunny and shady spots in the back, and decided that they too would make ideal spots for roots and tubers and vines, perfect for the cucumber, scallions, and kohlrabi. Oh yes, I have known about kohlrabi since I was a little girl. But that’s another post. Our neighbors, in the meantime, had poured red and orange landscaping rock into their own yards and planted elaborately carved evergreens called poodle trees. “Beans are good for them,” he countered hopefully. My father was not a meek person, but he knew when he had been bested. Besides which, my mother was right and my father knew it well. “Ah well then. The beans will have to go . . .” and off my father went to pull out the bean plants by their roots. A couple of hours later, my father found me and said conspiratorially, “I have something to show you.” He couldn’t stop smiling. What had made him so happy? We walked to the garage, and my father gleefully pointed to a large, 30-plus gallon garbage bag. “Look at that!” he exclaimed. “About what am I kidding? You can see it with you own eyes,” My father chortled. It was a very large plastic bag – the kind that came up to my hip. I am 5’7″. And it was stuffed to the top with green beans. Thousands of beans. “No, not yet.” He stared at the bag, smiling and chuckling to himself for a few moments. I can imagine now the myriad thoughts that must have occurred to him regarding such abundance. Right at that point, my mother came into the garage and saw the giant bag full of beans. She too stared for a moment, shook her head, and laughed. “What are we going to do?” she asked him. Dad bought another freezer, and we put it in the laundry room. Forthcoming in the “my father was a gardener” series: The year my sister made 25 loaves of zucchini bread in less than a month. Bean Posto is one of my favorite Bengali dishes. The Bengali name for this dish does not claim the potato because it is traditionally made with both beans and potatoes. There are unexpected dimensions here, silky textures and buttery flavors, with a strong undercurrent of heat to contrast against the creamy posto and the green bean that tastes so, well, it tastes green. It tastes of summer and warm afternoon breezes and meadows. And the beans are coated with velvety posto, a thick clingy sauce made with pale yellow poppy seeds that tastes indulgent, no matter the season. It snowed this week, our first real snow of the winter. And I made bean posto, partially as a form of resistance, and partially because our national-mostly-organic (super) market carted in beautiful green beans from somewhere far away. They were anomalous to be sure, but I found them difficult to resist. One can do this in two ways. 1. Grind the dry poppy seeds in a spice mill until powdery and fine. When ready to cook, saute in ghee or brown butter to heighten the buttery flavor of the poppy seeds. This method is easier and less time-consuming. 2. Soak the poppy seeds overnight with just enough water to cover. I soak them in a mini-blender and put the container in the refrigerator. They need to be soaked for a minimum of 4 hours and can be left in the fridge for up to 48 hours, if you forget about them (as I’ve done in the past). Blend for about 5-7 minutes, scraping down the sides periodically,and adding a tablespoonof water at a time to ensure proper consistency. When finished, posto is slightly grainy, thick and fluffy. Add oil to a sauté pan, heat the oil for a minute of two and then add the chili pepper and nigella seeds. Heat the oil until the nigella seeds become fragrant (about 2 minutes). Add the potatoes and cook for about 3 minutes over medium-high heat. Add green beans, toss to coat with the oil, add two tablespoons of water, turn heat to low, cover and set the timer for 5 minutes. After 5 minutes, season with salt and stir, add another tablespoon of water if needed, cover, and wait another 5 minutes. Check beans and potatoes for doneness and seasoning. Cook in this manner until vegetables are nearly done. When the vegetables are almost tender, add creamed poppy seeds and 1 tbsp ghee, and stir thoroughly to incorporate. One can add a pinch of turmeric at this stage if desired. Cook the dish for another 5 minutes or so, stirring occasionally, until the posto too is cooked. It will lose a certain raw seed grassiness and gain a mellower, nutty flavor as it cooks. Adjust seasoning if needed. 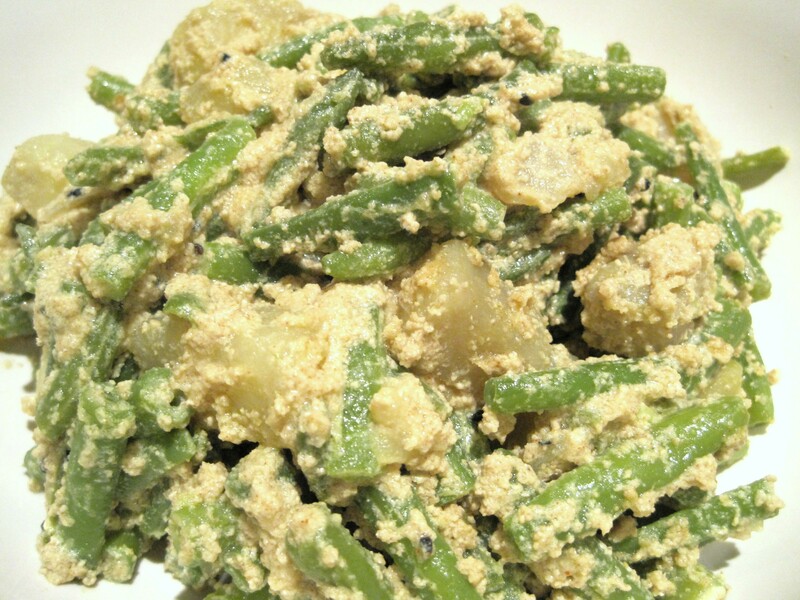 This entry was posted in Bengali Food, Green Beans, Poppy Seeds, Posto, Vegetables. Bookmark the permalink.